The Meskelly family winds its way through my stories for several reasons. I guess the main reason was the number of them. Two girls and eleven boys. The old man and the boys worked the land and kept the wolf away from the door. The oldest boy, James, slipped off and joined the Army. This event almost killed the old man. He blamed himself for the impending demise of his first-born. Not so. Old James just grabbed death by the ears, spit in its eye, and survived that war. To make matters even worse, James had been a paratrooper. He liked it better than farming and decided to become a “lifer.” In a round-about way I reckon it was James that put me and the old red Meskelly mule on a collision course with that damned old surplus Army parachute. James sent home a parachute because his mom had heard about but never seen any Nylon fabric. Being a woman who still made most of the clothes for her daughters and herself, she was curious about this new fangled stuff. James must have gotten his hands on a bunch of the things because they began to show up pretty regular for a while. Our rural mail carrier was a man named Joe Manasco. Joe had a hell of a time getting the packages containing the parachutes delivered. However, as legend has it, nothing stops the US mail. Wasn’t long until the Meskelly family had cornered the parachute market in Walker County. Meanwhile, my cousin Charles, the thinker in our bunch, had come across an ad in the Sunday edition of the Birmingham News. The ad showed happy half-naked young ladies being towed behind powerful speed boats. The girls were not water skiing but instead were hanging beneath a parachute. Charlie figured it was a neat way to fly once you mastered it. His ultimate aim was to sneak out his dad’s 1949 Ford V-8 and tow the parachute down the Cedrum Road, but for now, he needed to train a pilot. Lucky me would be that pilot. One of the Meskelly mules would tow me and the parachute. The reason for picking those mules was that the pasture where they stayed was composed of about twelve acres of flat grassy ground with few trees, not to mention the fact that the parachute was close at hand. The big day finally came. It was a pretty and sunny Saturday about the middle of September. Most of the adults were gone to town. We had the place all to ourselves. I believe every kid in our rural community was there. The Meskelly boys harnessed up a big red “Jack” mule that had been picked to be the power source. I was dressed in a long sleeve Mackinaw coat and a old coal miner’s safety helmet. “Old Cuz” had come up with darn near one hundred feet of rope to use for tying the parachute and yours truly to the mule. Once everything was attached it was lift-off time. We were ready, by gosh. Charlie’s original plan had been to ride his old “Roll Fast” bicycle and lead the mule by a rope tied to the harness. We never gave any thought to what to do if things didn’t go as expected. Murphy’s law, you know! Our first two attempts were pretty much what you’d expect. I’ve always felt that on that day the Good Lord was watching us. I can just imagine him getting a chuckle out of the show we were putting on. I figure he turned to Saint Peter and said, “Pete, lets have a little fun with these kids. Watch this.” He snapped his fingers and wind started to blow. We in our haste had missed the point that most all flying machines need to take off into the wind. The parachute was no exception. As we turned around to try again the wind caught the chute and filled it with air. It bloomed into a great cloud-like circle. Charles started peddling the bike faster and leading the mule into the wind. I ran after them dragging the parachute behind me. Once the tow line tightened up I noticed that my feet were skipping across the ground, just barely making contact, and then they weren’t touching the ground at all. The transition to flight was scary, as you can imagine. I didn’t have a clue about how I should try to keep this contraption stable and not go crashing into the ground that was now several feet below. No one knew the exact altitude I reached but all agreed it was “way up yonder”. Of course, the faster the mule went the higher I soared, and therein lay fertile ground for Mister Murphy’s law to kick my hind end. As I climbed higher with the sun at my back the shadow of me and the chute overtook the mule and cast our dark image on him. Mules are intelligent animals, as a rule always aware of what’s going on around them. This old red mule was no exception. When the dark shadow swept across his back he naturally glanced over his shoulder to see what was happening. That was about the time that Murphy pointed out to the mule that he was being followed by a “Booger” of some sort. The mule’s reaction was immediate and natural. He took off running. Charlie and the bicycle fell by the way side. Me and the mule and the chute headed for the other end of the pasture. I figure this was about the time that Saint Peter said, “Hey Boss, maybe you better check on this crazy hillbilly kid.” Suddenly the mule decided to turn around and head toward the barn. As the mule came around the parachute began to collapse into itself, and I hit the ground with a thud. It was about here that the Lord told Murphy to “beat it”. Charlie had attached the rope to a D-ring on my chute harness. He’d used a knot that he thought would hold but release fast in case I needed to get free of the mule. I couldn’t get hold of the rope end that I needed to pull to free myself. The old mule was running and I had a major problem. All of a sudden the rope tightened up like a bow string and snapped. It had tangled in a small stump and broke. The free end shot forward and smacked that old mule on his behind which only scared him more. He let out a loud “heehaw” and hid in the barn. As for me, I vowed to never let Charles talk me into such craziness again. Of course that didn’t work out to be the case. I mean who’s gonna believe a story about mule-powered flight. If a feller intends to become a legend he’s gonna have to do better than that. Larry, do you ever wonder how you survived the adventures of your youth? I know I do. I think that kind of experimentation with adventure and danger is a positive contribution to the formation of confident, capable adults — even though it sometimes results in scrapes and injuries. 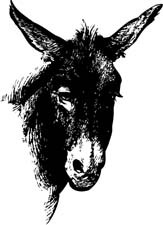 Maybe I’m just getting old and cranky, but I look at today’s young adults and wonder if perhaps being towed under a parachute by a mule might have made them better people. Grandpa, you passed away in 2012. Something told me to find your articles today, and I’m very glad that I did. I understand where I got my love for writing and telling stories. I miss you so much.